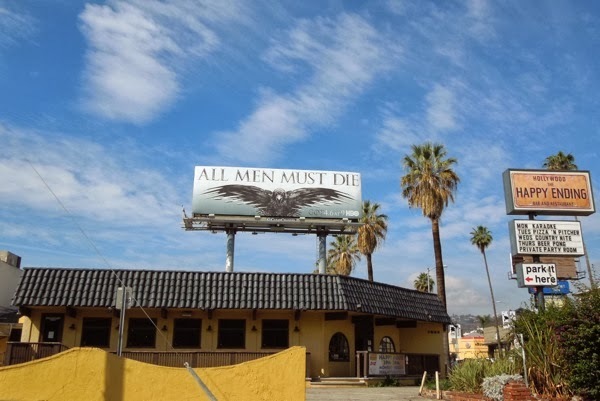 International Women's Day may have just passed this Saturday, but these 'All men must die' billboards aren't part of a man-hating feminist ad campaign filling the skies of L.A., but instead the teaser campaign for the fourth highly-anticpated season of HBO's Game of Thrones. 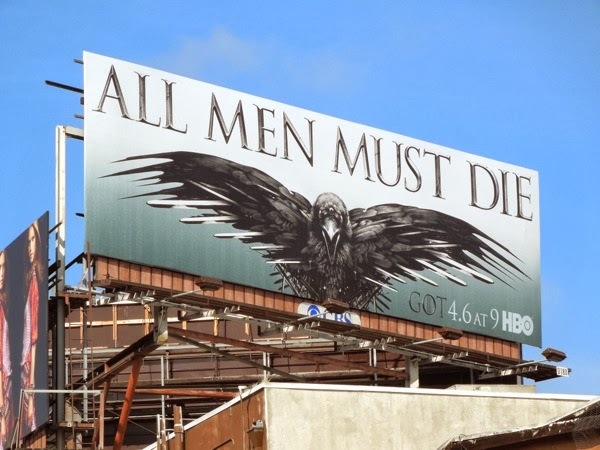 Fans familiar with George R. R. Martin's novels and regular viewers will know the show's Sworn Brothers of the Night's Watch are often referred to as 'black crows', and A Feast for Crows is the fourth installment of the author's seven-part fantasy epic, so this evocative imagery is immediately compelling for those in the know. 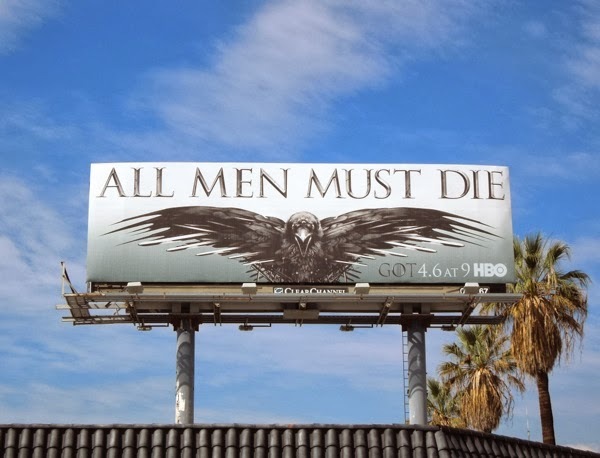 If you're none the wiser about the series it's still a striking image, and looking a little like the cover of a heavy metal band's album, it's on the giant-sized version that you can truly see the full scope of the ad creative, with all the swords tumbling like sharp feathers from the crow. 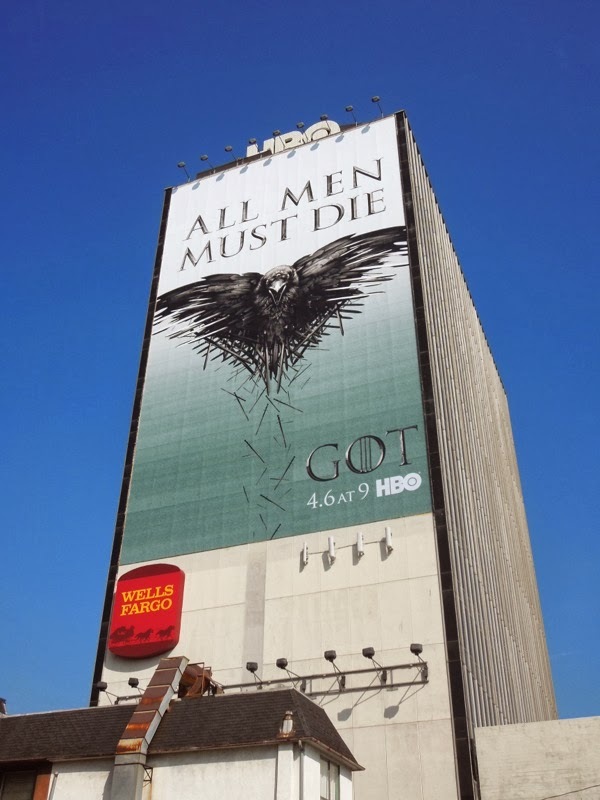 For the series debut it was Sean Bean as 'Lord Eddard Stark' sitting in the Iron Throne catching the eyes of passersby, then it was crowns and fire in the second season billboards for Game of Thrones and for the third season one of Daenerys' Dragons took centre stage in the promo advertising. 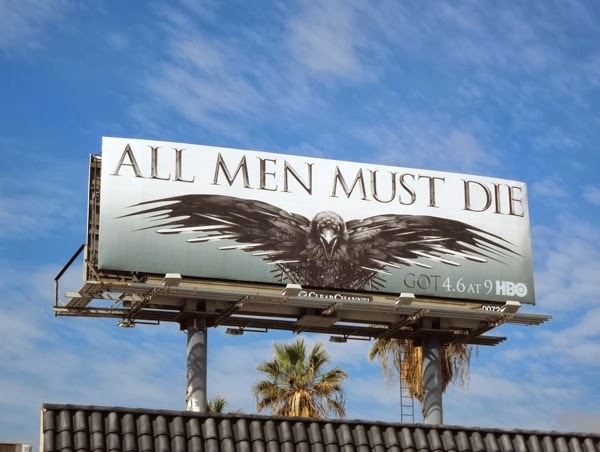 Now this ominous winged death doesn't bode well for the men south of the Wall in the land of Westeros with threats advancing from all sides, although how they could possibly top the twists and shocks of last season's 'Red Wedding' massacre episode is anyone's guess (although isn't that what we said when 'Ned Stark' rather surprisingly lost his head at the end of the first season). 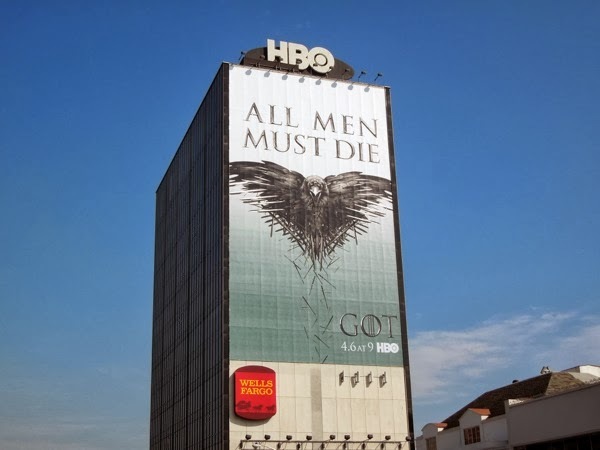 Yes, Game of Thrones has certainly captured audiences imaginations and these arresting billboards only help to heighten fans excitement and anticipation for the returning show. 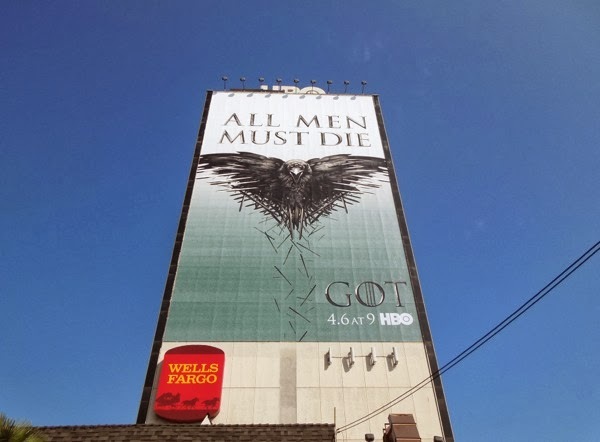 The spectacular super-sized season four billboard was spied towering over L.A.'s Sunset Strip with its foreboding omen on March 6, whilst the standard landscape ad versions were snapped in two different locations further east along Sunset Boulevard on March 3, 2014. 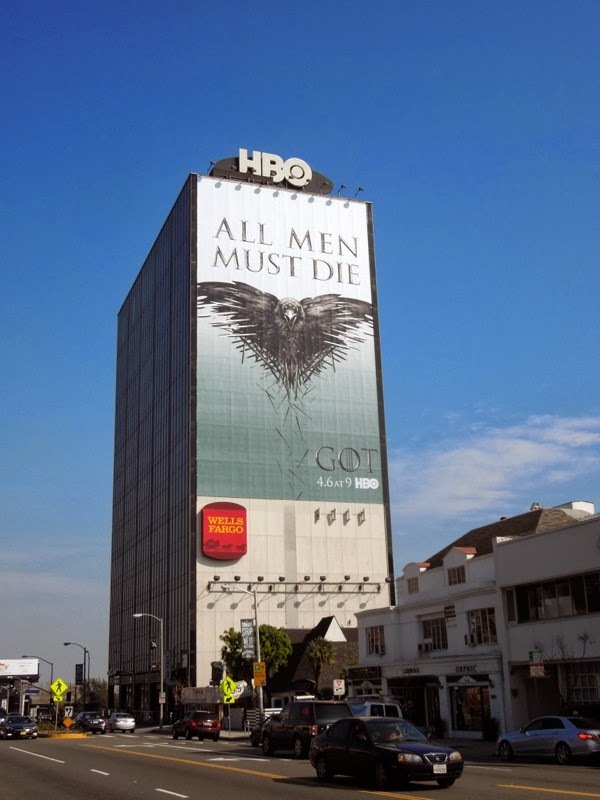 Long may the Game of Thrones reign as the monarch of televisual fantasy. 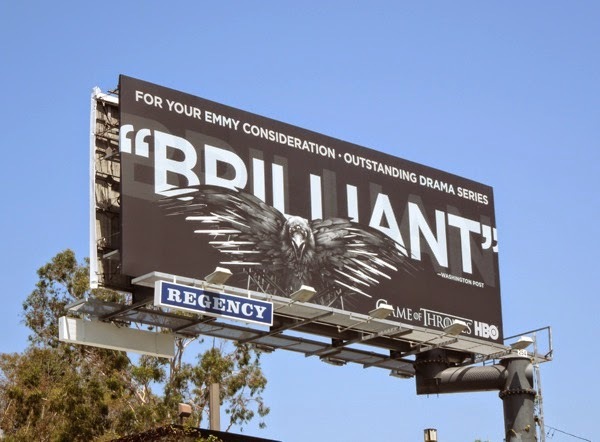 UPDATED: Here's the 'crow' season key art adapted and used with a quote from the Washington Post as part of HBO's 2014 Emmy Consideration ad campaign. 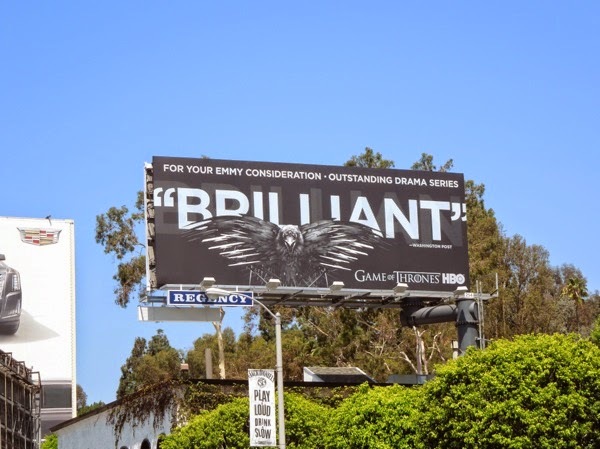 This 'Brilliant' ad creative was snapped along L.A.'s Sunset Strip on June 5, 2014, although after another amazing (and bloody) season, maybe descriptors like 'Surprising', 'Staggering' or 'Remarkable' would be equally apt adjectives.